- WCW Slamboree '95 (May 21) = In a dark match, Sgt Craig Pittman defeated Mark Starr. - WCW Great American Bash '95 (June 18) = In a dark match, Pittman took down Scott D'Amore. Later on, Pittman lost, via DQ, to Hacksaw Jim Duggan. - WCW Fall Brawl '95 (September 17) = Pittman beat Cobra. - WCW Halloween Havoc '95 (October 29) = In a dark match, Pittman won over VK Wallstreet. - WCW World War III '95 (November 26) = Pittman competed in the "World War III Three Ring Battle Royal" Match, which was won by Randy Savage (who won the vacated WCW World Heavyweight Title). - WCW Superbrawl VI (February 11, '96) = In a dark match, Pittman & Joey Maggs fell to Big Bubba Rogers & VK Wallstreet. - WCW Slambree '96 (May 19) = Pittman & Scott Steiner were beaten by Rick Steiner & the Booty Man in the Lord of the Ring tournament. Diamond Dallas Page won the tournament. 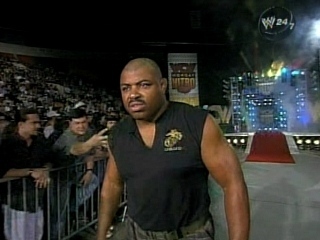 - World Wrestling Peace Festival (June 1, '96) = Pittman forced KGB to submit. 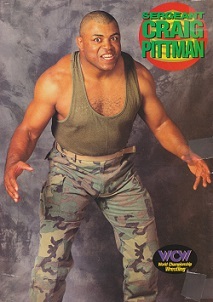 - WCW World War III '96 (November 24) = Pittman competed in the "World War III Three Ring Battle Royal" Match, which was won by the Giant.